Do the Islanders Boast the Best Defense in the East? Opinions vary on what it takes to go the distance in professional sports, but one notion reigns supreme: defense wins championships. If so, the Islanders are sitting quite pretty in a wide-open Eastern Conference. 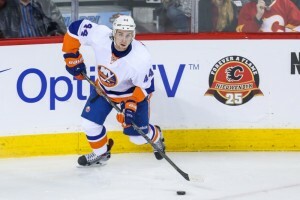 Calvin de Haan, enjoying a breakout season on the blueline, returned to the lineup Monday night in the Isles’ 3-2 win over the Panthers. As a result, blossoming star Ryan Pulock has been bumped to the third pair with Thomas Hickey, which is right where he belongs. Johnny Boychuk has been superb (surprise, surprise) since returning from injury on Feb. 6, Travis Hamonic is standing tall despite the burden on his shoulders, and Nick Leddy is, well, Nick Leddy. Marek Zidlicky injury notwithstanding, it’s the first time since the start of the season the Islanders have had a fully healthy defensive outfit. Back then, of course, Pulock wasn’t ready for the NHL yet, and coach Jack Capuano was still experimenting with Hickey, Zidlicky and Brian Strait (easy now, Isles fans) to figure out how to piece together the team’s sundry items on the blueline. Fast forward five months later, and everything has fallen into place. Taken as a whole, the Islanders’ defense might be the best in the Eastern Conference. From Boychuk and Leddy to Pulock and Hickey, there isn’t a weak link in the chain. They’re evenly divided between right- and left-handed shooters, which is no small thing, and diverse enough to fill just about every role a coach might envision. It’s not the most glamorous outfit in terms of star power, but give me depth over top-heavy talent any day of the week. Some say the Isles lack a coast-to-coast difference-maker a la Ryan McDonagh or Victor Hedman – well, tell that to Leddy. Others say they lack a shutdown behemoth a la Zdeno Chara or Dion Phaneuf – well, try that on Boychuk. And still others call for a precocious puck mover a la John Carlson or Aaron Ekblad – well, stick out your hand to meet Pulock. And for those that ask for a generational superstar a la Erik Karlsson or P.K. Subban – well, how are the Sens and Habs doing, anyway? That’s to say nothing of Hamonic, who snarls as freely as he skates; de Haan, who is so good he almost goes unnoticed; and Hickey, whose game continues to improve down the stretch. A word on Hamonic: for all the praise surrounding his skating ability, he’s often overlooked for his toughness. Indeed, with due respect to Matt Martin, Casey Cizikas, and Cal Clutterbuck, Hamonic might be the meanest player on this team – and certainly the feistiest. Think about the way he draws players like Alex Ovechkin and Evgeni Malkin off their game, incurring the accompanying wrath with twisted delight. He doesn’t stuff the offensive stat sheet but he’s an all-around stud nonetheless, a real rise-to-the-occasion type of player. That sound you hear is every Islanders fan groaning at the thought of him in another jersey next season. And a word on de Haan: in the same way Rangers fans learned to love Dan Girardi in the early stages of his career, Isles fans are taking to de Haan. He doesn’t make your jaw drop, but he rarely makes your heart drop either, which is a genuine blessing come playoff time. He makes the subtle plays – that quick little breakout pass – and the courageous ones – that suicidal shot block – all while maintaining an unruffled demeanor. Girardi has come to be called a cyborg among Rangers fans for this exact reason, and de Haan has many of the same qualities. Look, the Islanders don’t boast the most defensive talent in the Eastern Conference. The team’s top pairing, Boychuk and Leddy, doesn’t quite stack up with those around them – Anton Stralman and Victor Hedman remain the gold standard, in my opinion – and its best defenseman, Leddy, is a few rungs below his truly elite counterparts. But that top-four of Boychuk, Leddy, Hamonic, and de Haan is as strong as it gets in the East. Expand the distinction to include Hickey and Pulock and it doesn’t change. It took time for the current arrangement to come together, but as it stands now the Isles top-six defensemen can go toe-to-toe with any group in the Eastern Conference. There’s still work to be done on the defensive side of the puck, and that includes the forwards. With 2.45 goals against per game, the Isles rank fourth in the East, sixth in the League; of the last five Cup winners, no team ranked lower than second overall in goals against. If history is any indication, then, the Isles’ current average probably won’t cut it. But that average doesn’t reflect the work of the current defensive corps. Rather, it accounts for a team that has lacked, at alternating times, Boychuk, Hamonic and de Haan. Those three are back now, joining Leddy, Hickey, and Pulock on a revamped and refueled blueline. Expect the team’s goals against to come down as the season winds to a close. And then, expect these six defensemen to lead the Islanders’ charge into the playoffs. If it’s true that defense wins championships, the Isles have as good a chance as anyone.